Hi all. Several big announcements. First as you can see, we are giving you that boom boom boom. 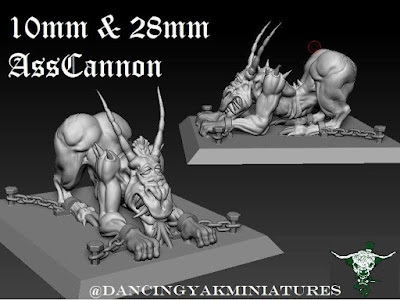 And here is the AssCannon, which we are very proud of, in 10mm and 28 mm. We hope all ID, CD, and ED fans of all styles will like this. This will come with a crew and we'll offer an add-on crew from Admiralty Miniatures. Second big announcement is for the next 3 months and hopefully forever, if you choose to support us and these projects they will be full time and very quickly released. Third I am proud to announce my partner and lead 3D artist, Yak Weinstein, who has agreed to make this his full-time project so we will be adding new things daily. Fourth we have found and rented workshop space very close to our homes so we are set for in-house casting. Finally, we are in negotiation for our molds for at least the 10mm to be made by a professional to avoid any issues. Hope you like, and any comments, suggestions, and critiques are most welcome. Please like and follow our page for more updates daily. Kickstarter is coming very soon. Hobgoblins and more this week. Much, much more 3-54 mm goodies to come.